I sent an Email to all the participants of the seed GROW project from my mrbrownthumb (-at-) gardenbloggers.com account. Please read it. 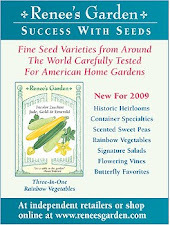 According to Nellie at Renee's Garden the seed packets went out in the mail to all the participants. Sign up to follow this blog by using the friend connect form on the right or the RSS button. We'll be posting links to all the posts every month. UPDATE: If you can or want to start your blogging about the seeds in March you can. GardenFaerie.blogspot.com will be doing a winter sowing themed post. Cool! Looking forward to getting started and comparing notes. Coincidentally, I was just admiring one of my nasturtiums for its enormous leaves. I don't remember which one I planted in that location and it hasn't flowered yet. One of the blogger's (jennsgardeningspot) just told me on Twitter that she got her seed packet in the mail. Looks like they included a bonus seed packet of a double cosmos. I'm so excited to be a part of this! Thanks so much to Renee for her generosity. I got my seeds today, too. It's only the Nasturtium we have to blog about, right? (I'm not wild about double flowers, esp. not pink, so I'm going to pass those on. I'm excited about getting started. This will be fun! I got mine today too. Monica, if you don't want them feel free to save them for me, ha! It was a pleasant package to get home to today. I think I will start some this weekend--there will be plenty of seed to experiment with at The Indoor Garden(er)! I got my seeds last night, and prepared my first post. I will be wintersowing most of these. I cant wait. got em! So excited. I'll be wintersowing some and direct planting some. Have three spots picked out with different shade-sun qualities. Yep, mine arrived Wednesday, with the bonus cosmos. I'll get them started this weekend, some in the ground and some in containers.